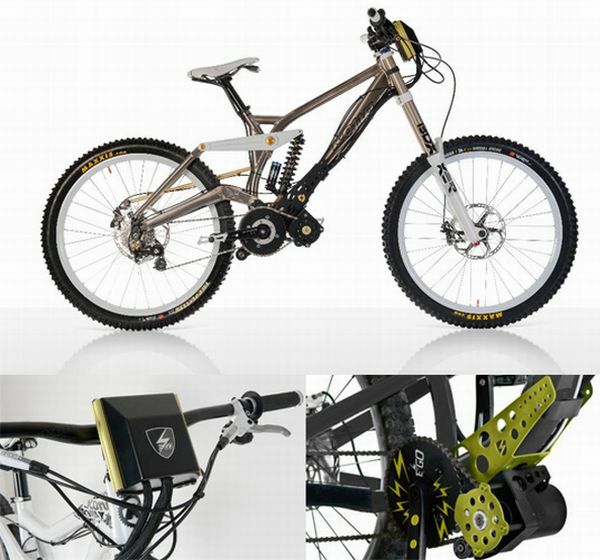 Ego-Kits Bolt-On E-motor = Bolt On Chairlift for DH Bikes? Whatever your stance on the advent of the E-bike and the impact it will have on our sport, there is no denying that more and more companies are starting to divert resources into E-bike R&D. Love it or hate it, E-bikes are popping up anywhere from Trek Stores, to Tommy Bahama Catalogs, even in Jay Leno’s Garage. While many cyclists are inclined to resist the electric assist, there are no doubt some people out there that would welcome the extra boost. One of the newest players in the E-bike market, Ego-Kits, is willing to bet that down-hillers will fit into the category of those who would welcome a little extra juice to get up the hill and are betting the farm with their bolt-on DH kit. While most E-bikes and E-bike kits have been geared towards commuters and city bikes, few have addressed the option of powering a down hill bike up the mountain, only to be ridden back down under the riders own power (before I go any further, I must mention the OSU Student that was ahead of the game, and created an E-DH bike that we featured a while back, that unfortunately I can’t find the link to). Basically, the Ego-Kit is a bolt on electric motor with a throttle control, that supposedly will bolt to a claimed 70% of all DH bike’s down tubes. Where’s the battery? How does it work? What does it look like in action? Unlike most E-bikes and E-bike Kits currently on the market, the Ego-Kit isn’t a hub centered brush-less motor (which is fairly critical due to the wide variety of downhill hubs on the market). Instead, it features a 1200 watt motor that is bolted to the down tube via an aluminum housing. The motor then drives a special crank that is fitted with a freewheel so that the motor, or you, can power the rear wheel at any time without interference. Also unlike most E-bikes, the battery isn’t contained within the frame, or on a rack. No, on the Ego-Kit you carry the battery in a back pack that is then plugged into the bike through a connector, just under the nose of the saddle. The Kit includes a back pack to carry the battery, which on their site is shown as a Camelbak Mule. While E-bike batteries can generally contribute to much of the total weight of an E-bike system, the reasoning behind the back pack is to keep the bike as light as possible for the best handing. Not to mention that most DH bikes with tight frame designs and ample travel would have a hard time finding the needed space to mount a decent sized battery. Regardless of your feelings toward E-bikes, you have to admit that the Ego-Kit is at least intriguing. It has already won the ispo brandnew award for 2011, and my guess is that is just the start. The Ego-Kit certainly expands the horizon of what’s possible with an E-bike, the question is how it will be recieved. So what do you think? Love it? Hate it? Not sure? Let us know. As an engineer, I love it. However, if this catches on, the social and political effects could be disastrous. Self-shuttling will empower thrillseekers to treat every mountain as their own private DH park, tearing up the trails on neo-motorcycles that have no business being there. That would be a great way to get mountain bikes banned from yet more trails. Another issue is that as the technology improves, this isn’t going to be just self-shuttling. It’s going to become more and more indistinguishable from actual motorcycles, with all the potential for trail damage that implies if used irresponsibly. In short, we’re going to need to figure out what to do about these things on our own terms before somebody legislates it for us. 100% percent agree with KGr. The sad thing is that most likely, just like in nearly every other walk of life, we cannot expect the people to use this technology in a responsible manner. That’s a freaking motorcycle. If you don’t want to pedal, get off the bike, you nancy, and I’ll pedal it for you. It’s a DH bike with a built-in ski lift !!! I can’t wait to see these at Apex.